I'm in doubt with the PYRO-ENERGEN. Is there any scientific proof of it? Isn't it true that science you know today failed to heal you? Then, why do you need scientific evidence? Your illness may remain as is if you just think about it, or because you have tried so-called modern devices previously and failed to get healed. That's why you cannot believe another machine anymore unless there's scientific evidence. It's true that we receive many comments from both pro and anti groups. Some say that the PYRO-ENERGEN technology is a fraud. Others say it works remarkably with its wonderful technology. 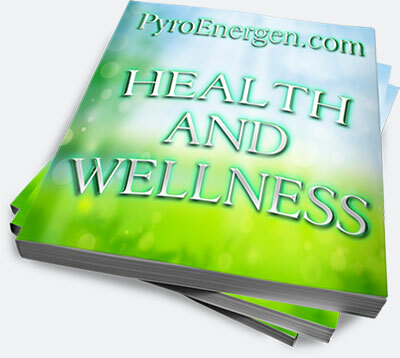 We highly recommend that you read our literature "How PYRO-ENERGEN Works". If PYRO-ENERGEN is so effective and can save many lives, why isn't it widely publicized in mainstream media? Aspirin for example is FDA approved, yet thousands of people die every year because of aspirin. Coumadin, Prozac, Diprivan, are all FDA approved but they're not safe! The truth is the FDA, or any other corresponding government agencies for that matter, is known to have some sort of financial ties with drug companies. Also, do you think you should trust an agency that approves the use of cigarettes for human consumption? We don't fabricate testimonials. We also don't pay any of our customer money just to write a testimonial. Considering the type of product we are selling, don't expect to see many documented testimonials and even a video testimonial. People in general are ashamed of disease, especially sexually transmitted ones. Few people realize or care about the fact that their one healing testimony can lead the way for hundreds of others. However, we do try our best to gather the most inspiring and genuine testimonials for you to read. To maintain good health, daily PYRO-ENERGEN use is recommended. When you're suffering from any abnormal health conditions, it is good to use it as often as possible. We recommend a treatment frequency of 3-5 times a day, at 30 minutes per session. The more often you use it, the faster it can eradicate the root cause of the disease. Even if you don't have a disease, using PYRO-ENERGEN will still help you maintain good health and prevent disease. The reason behind this lies on the theory of the outside negative energy force, in which the negative energy (disease-causing agent) that surrounds the patient's body is repelled by the PYRO-ENERGEN immediately after one session. Therefore, using the machine beyond the 30-minute timeframe is basically useless. However, it does come back at a later time (in some cases in just a few hours), requiring you to use the machine again. This explains why some patients suffering from an illness may feel immediate relief from symptoms like unknown body pain, migraine, weakness, nausea, etc., after using the PYRO-ENERGEN in just one session. However, these symptoms reappear later on the day, unless they do another session. In some cases, the negative energy is more active at night. 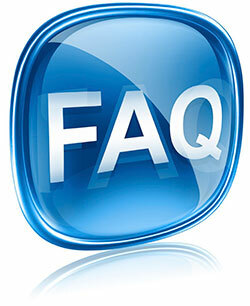 Therefore, the efficacy of the overall therapy will depend on how often you use the machine. This is a case-to-case basis. We cannot exactly determine how easy it is for the machine to eliminate a specific disease as every person's body behaves differently. Depending on the disease, it can range from a few days, weeks, or months. You can use it while reading books, watching TV, etc. You don't even need to remove any metallic items worn such as wrist watch, necklace, ring, buckle and eyeglasses. However, using a phone, or personal computer while using PYRO-ENERGEN is not recommended. We have not tested this and the static electricity may damage the circuitry of these mobile gadgets. The machine is user-friendly. It is very simple and easy to operate. Refer to "How to Use the PYRO-ENERGEN" for details. The machine can last for at least 20-30 years when properly used under normal conditions. The answer together with quick comparison can be found here "The PYRO-ENERGEN vs. Other Electromedicine or Electrotherapy Devices". No. The earliest recorded medical use of electricity is in 46 A.D. when the Roman emperors' physician recommended treatment with the electric torpedo fish for rheumatism and gout. Also, Benjamin Franklin used electricity to treat people with neurologic problems. So actually, electricity has been used for health treatment long before our generation! 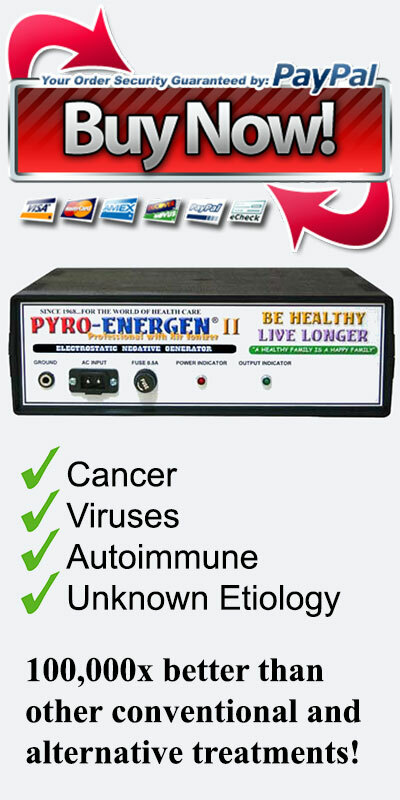 Only the PYRO-ENERGEN has the ability to eradicate the root cause of various diseases quickly and without any side effects. No. PYRO-ENERGEN is neither a Van de Graaff generator nor a negative ion generator. We recommend that you read the inventor's article entitled "The PYRO-ENERGEN, Van de Graaff Static Generator, and Lightning". The PYRO-ENERGEN's technology and design are trade secrets. It is the first and only one of its kind in the world. Yes. It is safe. Metal implants and pacemakers are embedded inside the body or placed under the skin. Since the PYRO-ENERGEN's negative static electricity is noninvasive, there's no way it can penetrate the skin and affect the implants. The law of static electric fields states that static electricity does not penetrate electrically conductive objects such as the human body. The field induces a surface electric charge that is always perpendicular to the body surface. The only thing to remember is that implants that are 'wearable' electronic devices or are connected to other external device cannot use the machine as the static electricity might damage these electronic devices. You'll receive a small amount of shock for a microsecond if someone touches you or when you touch a grounded object accidentally. This is like touching a doorknob and you get a shock because your body has strong static electricity buildup. Since the PYRO-ENERGEN produces extremely low amount of current, the shock is harmless and has no ill effects. To be electrocuted takes thousand times more electricity. The static electricity that the PYRO-ENERGEN produces may interfere with the medical filtering process. We recommend you to use the PYRO-ENERGEN 'after' your dialysis session.